Freebies like breakfast and in-room internet access help our guests stay within budget at the Super 8 Griffin. The two-story Super 8 offers 35 rooms with satellite TV work desks and free high-speed internet access. Units are accessible via exterior corridors. Enjoy a free breakfast of pastries coffee juice and cereal each morning. The lobby features complimentary coffee and a photocopy center for guest use. Parking on-site including space for RVs and trucks is free. 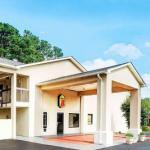 Located on Highway 41 the Super 8 is two-and-a-half miles north of the University of Georgia's Griffin campus. Southern Crescent Technical College is three-and-a-half miles away while the center of Griffin is five miles south. Racing fans will be pleased with the hotel's proximity to the Atlanta Motor Speedway a 10-minute drive north. It's 45 minutes to downtown Atlanta attractions and Hartsfield-Jackson Atlanta International Airport is 28 miles away.